Some random notes on what to do with the stuff that I want to keep but don’t want to take with me. The biggest single item is my bed frame (and mattress) and then I’ve kitchen stuff, some clothes, books, records and a computer or two. I’ve slimmed down a lot. I’d like to keep it all in one place I think – having stuff spread over several attics, box rooms and garages is probably more cost-effective and doubtless more interesting artistically, but a pain in the bum that I don’t really need. 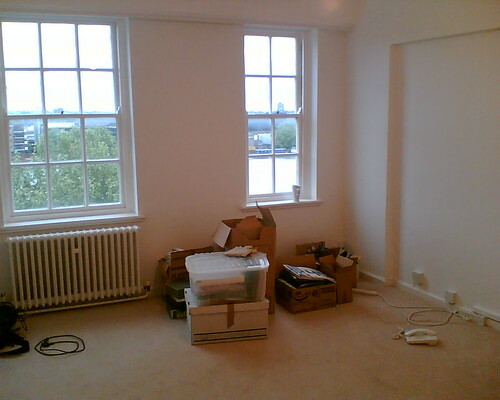 To store in Central London or not? and whereabouts anyway? What “visiting rights” do I need? Any recommendations for good service? Those big storage places are weird aren’t they? The other day, talking to Nick, we came up with the idea of a documentary just asking people as they went in what they were storing and why, so many interesting stories, I’m sure. Previous PostClearing up. Let’s Fight!Next PostShh! don’t tell anyone, but the wankers have gone! Looks just like our place!